The housing depression will last for a decade or more. This is by design. The Fed has been working with the banks to withhold inventory so prices do not fall too fast or too far. That way the banks can manage their write-downs without slipping into insolvency. But what’s good for the banks is bad for the country. Capital impairment at the banks, means no credit expansion in the near-term. It means the economy will continue to contract, unemployment will remain high, and deflation will push down wages and prices. Everyone will pay for the mortgage-backed securities scam that was engineered by the banks. Typically, personal consumption expenditures (PCE) and real estate lead the way out of recession. But not this time. Both PCE and RE will stay depressed and act as a drag on employment and growth. Last week, in testimony before the congress, Fed chair Ben Bernanke made it clear that the Central Bank has no intention of providing extra monetary stimulus to make up for rapidly-dissipating fiscal stimulus or the winding down of government subsidies for auto, home, and appliance purchases. The economy must muddle through on its own. But without additional pump-priming, disinflation will turn to outright deflation and the economy will sink into negative territory. Bernanke knows this, but he’s absolved himself of any further responsibility. It’s just a matter of time before the next slump. If we look up all the gory details in the fed Flow of Funds, we find that household real estate fell from $23 trillion in 2006 to $16.5 trillion at the end of 2009. That is a decline of $6.5 trillion, more than half the total $11 trillion lost in the credit/housing bust. Home mortgages have fallen a negligible amount, from $10.48 trillion in 2007 to $10.26 trillion at the end of 2009. As of the end of 2009, total equity in household real estate was a paltry $6.24 trillion of which about $5.25 trillion was held in free-and-clear homes (32% of all household real estate, i.e. 32% of $16.5 trillion). The bursting of the housing bubble wiped out the middle class. Now–even in the best case scenario–private sector deleveraging will continue for years to come. Baby boomers are not nearly as wealthy as they believed; they must slash spending and save for the future. US household debt as a share of disposable income, remains historically high (122%) and will have to return-to-trend (100%) before consumers loosen the purse-strings and resume spending. Repeat: 51 million homeowners have a meager $1 trillion in home equity. We’re a nation of paupers. “How much should we worry about a new leg down in the housing market? If the number of foreclosed homes piling up at banks is any indication, there’s ample reason for concern. A 9-year backlog of homes. No wonder the yield on the 10-year Treasury is under 3%. The country is in a Depression. Housing prices have already fallen 30% from their peak in 2006, but they temporarily stabilized during the period that the Fed was exchanging toxic mortgage-backed securities (MBS) for $1.25 trillion in reserves. The banks collaborated with the Fed (I believe) to hold back supply so the public would be duped into thinking that Bernanke’s cash-for-trash (Quantitative Easing) program was actually supporting the market. But it wasn’t. Prices stayed flat because the banks were deliberately withholding supply. The Fed’s action did nothing. Now that Bernanke has ended the program, inventory is rising. How far prices drop will depend on the rate at which the banks dump their backlog of homes onto market. The longer the process is dragged out, the longer the recession will persist. The housing market has been nationalized. More than 95% of the funding for new mortgages comes from the government–mainly Fannie Mae, Freddie Mac, FHA guarantees or VA loans. There is no market in housing–it’s all central planning with the Fed acting as the financial Politburo. It’s all designed to stealthily transfer the losses of the Kleptocrats onto the taxpayer. Subprime lending continues behind the mask of FHA-backed mortgages. FHA underwrites mortgages with as little as 3.5% down and credit scores in the high 500-range. It’s a joke. The lending system is designed to implode and it will, leaving more red ink for the public to mop up. Nothing has changed. “Let’s begin with Chicago…..As of July 15, RealtyTrac listed 28,829 properties which had been foreclosed and repossessed by lenders. Some have been owned by the bank as long as 2½ years without having been placed on the market. Roughly half have been repossessed by the lender since late January 2010. We can see that the banks are deliberately keeping homes off the market to keep prices artificially high so they don’t have to write down the losses. Clearly, the Fed knows what’s going on. 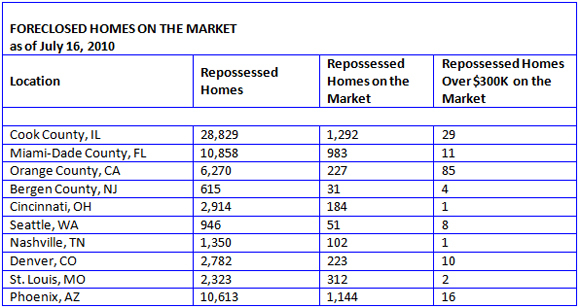 In Miami-Dade County, the same thing–“Out of 10,858 bank-owned homes, a mere 983 were listed for sale…. Now that the Fed’s mortgage-backed securities buyback program (QE) is over, the banks are stepping up foreclosures and short sales. Expect more homes to flood the market pushing down prices. But whether the banks release more of their shadow inventory or not, it will still take years before the market returns to a (normal) 5 to 6 month backlog. Take a look at this chart and see the extent to which the banks are deceiving the public. There are remedies for our housing woes, but they require massive government intervention. Mortgages must be restructured in a way that keeps as many people as possible in their homes. That means bondholders and banks will have to take a sizable haircut, which is the way capitalism is supposed to work when risky investments blow up. The write-downs will force many of the banks into bankruptcy, so the Obama administration will have to resurrect the Resolution Trust Corporation (RTC) to resolve the banks, replace management, and auction off their downgraded assets. It’s all been done before. When the toxic assets and non performing loans have been purged from bank balance sheets, the banks will be able to fulfill their function as providers of credit to consumers, households and small businesses. Credit expansion will lower unemployment, reduce excess capacity and increase GDP. The economy will begin to grow again. Regrettably, Bernanke has chosen the path of deception and deflation, which is why there won’t be any real recovery until he is removed.